In May '11, Gourmet posted a list of 50 Women Game-Changers (in Food) that runs the gamut from food writers to cookbook authors to television personalities to restauranteurs to chefs to food bloggers. Some are a given. Some are controversial. Speaking the names of some brings fond childhood memories to some. Speaking the names of others will make some readers cringe. And of course, some of our favorites were not even included. We food-lovers are a passionate bunch of people and whether we agree or disagree, every woman on this list has earned her place for a reason. Being a woman who is passionate about food (cooking, eating, talking about, writing about, photographing), when I caught wind of Mary from One Perfect Bite's idea of cooking/blogging her way through each of these 50 women...one per week...I knew I wanted to join her. Many of these women paved the way for us in culinary school, in the kitchen, in cookbooks, in food writing, and on television and I think it is a fabulous way to pay tribute to their efforts. Some of the women on the list have been tops with me for years. Some I have heard of (perhaps even seen, read, or cooked from) before. And there are even a handful that I am not familiar with at all. I excited to educate myself on each of these women game-changers and hope you look forward to reading along. We are going in order from 1 to 50. 1. Julia Child- The great Julia needs no introduction. Especially not after the great Meryl played her in the movie. I grew up watching Julia on t.v. She was so magnetic. I don't know if I was more intrigued by her unique presence or the food she cooked. I think it was a combination of both. Whether watching old episodes of The French Chef or new episodes of Dinner at Julia's, my eyes were always glued to the t.v. for that 30 minutes or so. I loved her nasal-tinged, sing-songy voice. I loved it when she gave people a hard time in her jolly manner. I loved it when she took a bite of something. I loved it when she said Bon Appétit! Back then I didn't know (or care) that she was once a member of the Office of Strategic Services (OSS). I didn't know anything about her one great love, Paul Child. I had yet to learn about that first meal in Rouen that was "the" major landmark in Julia's love affair with food...were it not for that meal would we still know and love Julia? My fascination and adoration for Julia never dissipated. I adored watching Julia with Jacques Pepín and Baking with Julia. She was one of my cooking inspirations and one of the people I wish I could have met before she went to that great kitchen in the sky. Place egg yolks, salt, pepper, and 1 Tbs. lemon juice in jar of blender. Cut butter into pieces and heat it to foaming hot in a small saucepan. Cover the jar and blend the egg yolk mixture at top speed for 2 seconds. Uncover (preferably remove the center piece of your lid) and still blending at top speed, pour in the hot butter in a thin stream of droplets. Be careful of hot, spitting liquid (which is why I recommend just removing the center piece). The sauce should be thick. Taste and adjust seasoning with more lemon juice &/or salt and pepper. If you're not using sauce immediately, set the jar in tepid (not warm) water. *3 egg yolks can actually hold about 8 or 9 ounces of butter...but your blender may not be able to push through the "thickness" of it. If you have a pretty powerful blender, then you can melt another 4 oz. of butter and add it in in the same manner. You could turn the initial amount of sauce out of the blender into a large-ish bowl, then beat in the remaining butter by hand in the same, thin stream of droplets. 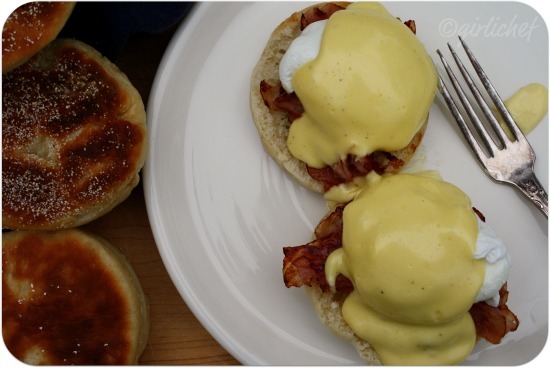 And of course you have to use that Hollandaise to make Eggs Benedict. I mean, come on...how could you not!? To make it "right", you should use (heated, usually steamed and not usually browned) Canadian Bacon, but if don't have any, then I just brown some ham (I like the extra layer of flavor that browning it adds)...I'm perfectly fine with it. If you're not, then by all means use Canadian Bacon. Toast your muffin halves. Poach your eggs. Heat your Canadian Bacon (or ham). Lay the English muffin halves down. Set the ham on top. Place the poached eggs on top of the ham. Pour as much warm Hollandaise on as you'd like. Season with salt and pepper. Take a bite. Swoon and commence eyes rolling into back of head. Repeat until plate has been licked clean. *Normally, this will be a weekly post (on Friday's), but since I missed the first two weeks of cooking along with the crew, I am playing catch-up. I will be bringing you #2 on the list tomorrow...and picking up on Friday with #3. From there on out, this will be a weekly feature until all 50 ladies have had their turn. Julia...oh, Julia! I loved watching her...even when I had no idea exactly what she was doing. 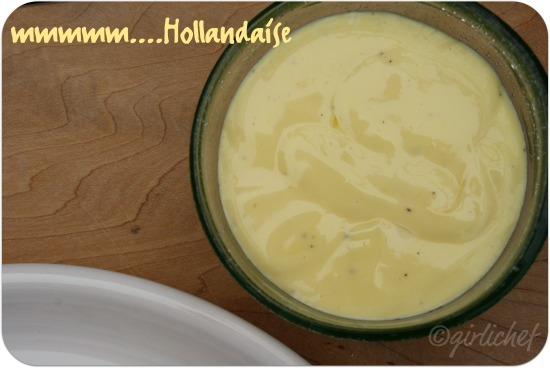 This is a great theme...your Hollandaise looks really creamy and smooth. Oh, what a fun idea! Looking forward to this! I love this challenge and have had lots of fun following Mary and Joanne along in their challenge. I'm excited that you'll be participating too. I wish I could get organized enough to do it myself. This post is a glorious display of one of my favorite all-time meals. I love eggs benedict. Your hollandiase looks perfect! I love this idea and can't wait to watch as you cook your way through the 50 - I'm sure it will be just another way these women will inspire us all! I will ignore the rampant sexism in the whole idea... BUT I THINK THIS IS AMAZING! Just now hearing of it. Oh who can not know Julia. I'm doing a collage of her and her husband right now and have actually been doing a lot of thinking about her. I guess because her birthday is rolling around soon. She would have been 99 on August 13th and then her passing was on August 15th, 2004, a couple of days before her birthday. I can't believe she has been gone almost 7 years. I think it's great to acknowledge our wonderful chefs. Good luck, I'll keep watching. I absolutely love the quote from Julia Child! Thanks for sharing the quote and the recipe for Hollandaise Sauce. I'll have to try making it next weekend. I might even get loaded beforehand, don't know if I'll be whacking any chickens, that I'll save for another day! The blender makes this sauce a breeze to make. Beautiful photos Heather. 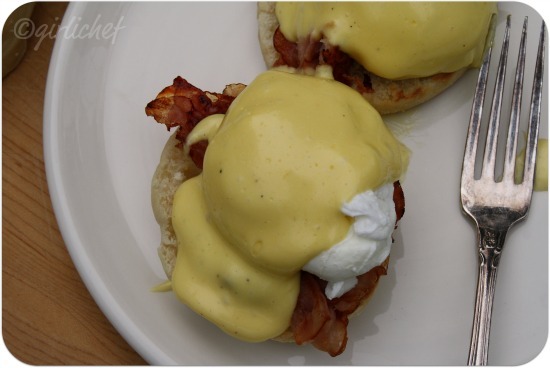 I love hollandaise and it has so many uses past the ever so popular eggs benedict. That being said, I've never tried to make it myself. You've inspired me to try. The list is amazing. Lot to learn and discover especially for an Italian girl like me. I'm so excited you're joining in Heather! yay!!! This hollandaise looks fantastic. It's one of those sauces that I absolutely love but am kind of scared to try myself. You make it look easy, though! Here's to women game-changers! 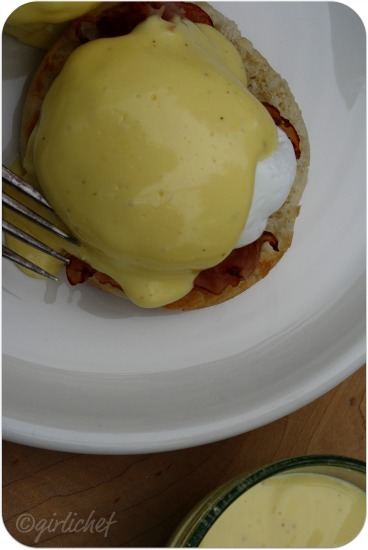 Your hollandaise looks divine. I am a little obsessed with Julia Child. Maybe more than a little. My only problem with hollandaise is that I can't stop eating it. I'll dip pretty much any bread-like item in it just so I can eat more and more and more of it. Mmmmm. This recipe looks faster than the one I usually make too! I'm late to the party, but this is such a fabulous series! I'll go check out everyone's posts - maybe I can join? I tried making eggs benedict and hollandaise in my "accomplished cook" series, didn't do so well, but I am going to try again. Pinned this post for my future try, thank you! love this! i once made julia's omelette, and it was the best i've ever had, i adore julia child! what a fun project, i can't wait to see who's next. the eggs and sauce look incredible! how fun!! I enjoyedt joanne's and mary's post..now i look forward to yours, julia's the best!! Woww.. another one of your awesome yummy dishes :D I have never tried this.. But I gottu..
That looks like a perfect breakfast- or supper for that matter. Love the Julie and Julia movie :) Thanks for coming by and sharing your recipe. Have a great weekend. That benedict looks like absolute perfection! Yum!